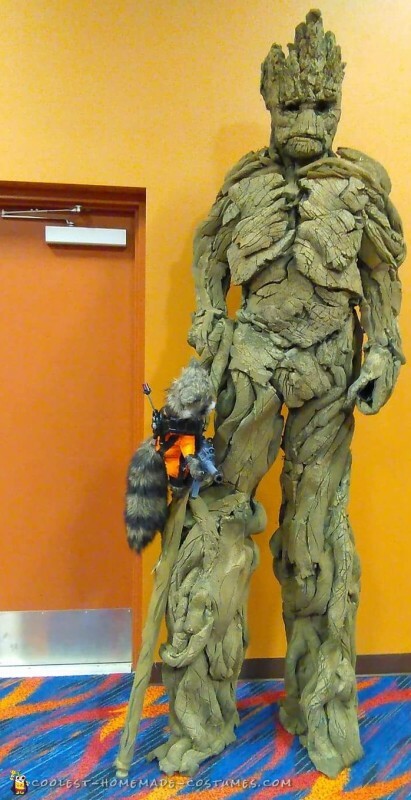 I just knew when I saw the movie “Guardians Of The Galaxy,” that I had to try to make a DIY Groot costume! I began with the head and a plastic coffee can. I added foam and began to add and shape foam to make his expressions. The body was harder, because I had to convince my (manly) son in law, to wear a woman’s tight body suit. Then, I began sculpting foam and adding it to the body suit. I did this while he was wearing it. So, he had spray glue bleeding through into places that I can’t even mention lol. He wore 2 ft drywall stilts. which were also covered in foam. I had to paint it several times. And then the paint dissolved the glue..so I had to repair them constantly. 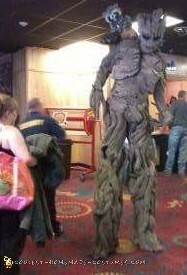 But, finally, after it was all finished, we went to a casino on Halloween to enter the contest. My son in law had a line of people all night wanting to pose for selfies. Most people thought it was store bought. But the kids had the best reactions. 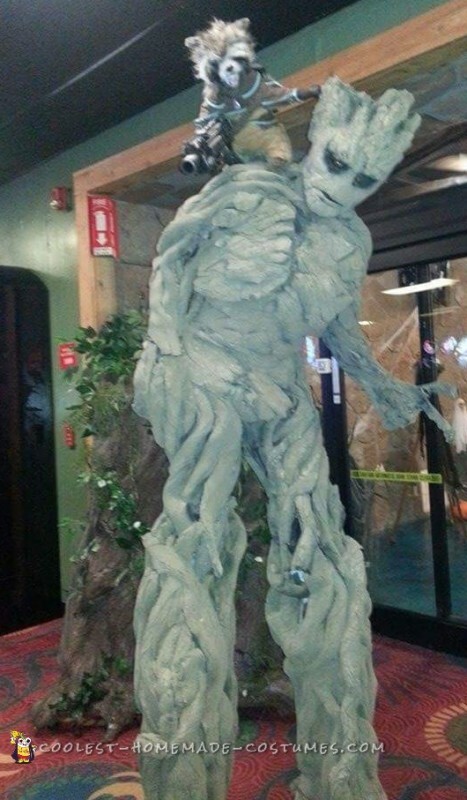 In any Language all the kids screamed GROOT GROOT! I wish I had more places to use this costume because it is just so cool! Thanks for letting me share it here! Also, I might add that I got most of the materials from dumpster diving. Which in itself….was an interesting experience. The people who saw me in there ….. offered me food and clothing – lol. They were apparently thinking I was homeless. I explained that my truck was near by and I had a home. They replied “well you can’t live in your Truck!!! !”…..